State and local government construction costs are inflated by New York’s “prevailing wage” law, which requires contractors on public projects to pay their workers the amounts required by union collective bargaining agreements. The “wage” mandated by the law includes expensive union fringe benefits, which can approach or exceed the cost of hourly pay. The law also effectively requires contractors on public projects to organize and assign work as required by inefficient union rules. The law drives up total construction costs by 13 to 25 percent, depending on the region, which will translate into billions of dollars in added taxpayer-funded spending under current multi-year capital plans. The law is supposed to apply only when union contracts cover at least 30 percent of the workers in a given building trade in a given “locality”—but the New York State Labor Department doesn’t verify that the threshold is being met, and localities are defined on the basis of union jurisdictions. The public works pay mandate effectively serves as a taxpayer subsidy to shore up underfunded construction union pension and welfare plans. New York State, its local governments and public authorities are committed to spending tens of billions of dollars on public works in the next five to 10 years. But a sizable chunk of that money will be spent unnecessarily—subsidizing the above-market compensation of a shrinking but privileged cadre of construction workers. The culprit is New York’s requirement, rooted in the late 19th century, that contractors pay the local “prevailing wage” on publicly funded construction projects. The phrase is both antiquated and misleading—since the pay levels mandated by the law are neither truly prevailing nor limited to wages, in the normal sense of either word. The law defines “prevailing” as the amounts set forth in union contracts covering at least 30 percent of workers in specialized building trades titles in a locality. And the mandated “wage” includes high-priced union fringe benefits, which can equal or even exceed a worker’s hourly cash pay. In an era of increased emphasis on transparency in government, the process for determining and implementing New York’s prevailing pay mandate is extraordinarily opaque. For example, the Labor Department does not release contract documents that form the basis for setting the wage. And it apparently does nothing to verify that the 30 percent union coverage threshold is actually being met in all localities. 25 percent more in the New York City region. These cost differential estimates are surely on the low side, since the comparative baselines used to compute them were regional medians of occupational wages for all non-residential building construction workers, including those paid union scale. Applied to New York’s current and projected capital budgets, these findings translate into billions of dollars in excess costs over the next few years. This, in turn, translates into both fewer projects and higher taxes, increasing the challenge of making the Empire State a more affordable, attractive and competitive place to live, work and do business. The law doesn’t just put more cash into the pockets of current workers. By underwriting union fringe benefit rates, it also subsidizes high-priced construction union pension and welfare plans—most of which are grappling with long-term funding shortfalls exacerbated by aging demographic profiles. Taxpayers are simultaneously supporting future pension benefits earned by current workers and bailing out underfunded pension plans for retired workers. Twenty-five top New York-based construction union pension funds covering nearly 188,000 workers, retirees and their beneficiaries had unfunded liabilities totaling nearly $12 billion, and most of the pension funds had less than half the money needed to make good on their benefit promises to current and future retirees, when measured on a market-rate basis. Just over one-third of employer contributions to construction union pension plans were needed to cover the actuarially determined “normal” cost of benefits earned by active workers. The rest—nearly two thirds of pension contributions—were billed in order to cover the plans’ unfunded liabilities. Employer contributions required solely to backfill union pension and welfare fund liability shortfalls can account for more than 10 percent of the total hourly compensation required by the prevailing wage law. The social contract obligation to past generations is a serious one, of course. But the high and rising cost of meeting that obligation for unionized building trades is never acknowledged when prevailing wage policy is discussed in New York. Beyond higher compensation, the prevailing wage law imposes added contract administrative costs and union work rules that can erode productivity. While difficult to quantify, the productivity impact of work rules should be considered by policymakers as a potential counterweight to claims that union members save money through superior, more efficient workmanship. 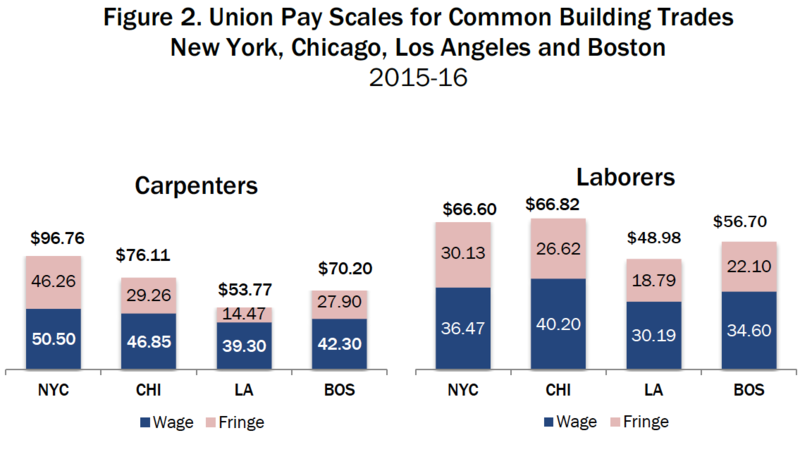 As also shown in this report, the union pay scales for New York City’s construction trades easily exceed those even in other high-cost, union-friendly cities such as Boston, Chicago and Los Angeles. In addition to Governor Andrew Cuomo’s recent push to expand the prevailing wage law to New York City affordable housing projects, some state lawmakers want to further widen the law’s reach. For example, as of 2017, two Senate Republicans joined with two members of that chamber’s Independent Democratic Conference to co-sponsor legislation applying prevailing wage requirements to all projects “paid for in whole or in part out of public funds,” including those receiving tax-exempt financing through industrial development authorities. The findings of this report highlight the enormous potentially added expense associated with such proposals. New York’s prevailing wage mandate is rooted in the state Constitution, but the costly details are stipulated in Section 220 of the state Labor Law. The final section of this report lists Section 220 reforms that will allow many more construction firms and workers in New York to compete for public works contracts while paying wages reflecting the truly “prevailing” labor market conditions across the state. Laws mandating “prevailing wages” for public works projects originated on the state level in the late 19th century, a period marked by rapid industrialization, increased worker mobility across state lines, and an influx of foreign immigrant labor. New York was the second state to pass such a law, in 1894, and others quickly followed suit. The federal government’s prevailing wage law can be traced to a 1927 project on Long Island, where a non-union Alabama builder won the federal contract to build the Northport Veterans Bureau hospital. Because it was federally sponsored, the hospital construction was not subject to New York’s prevailing wage law, so the contractor was able to import a cheaper, racially mixed work crew from Alabama. For nearly 50 years, federal regulations defined the Davis-Bacon Act prevailing wage as the wage (and, after 1964, combined wages and benefits) paid to at least 30 percent of workers in a given craft in a given locality, or as a weighted average of all wages and benefits if no single amount was paid to at least 30 percent of the workers. This became known as the 30 percent rule. In 1981, the Reagan Administration issued new regulations that raised the Davis-Bacon Act compensation threshold to “the majority (more than 50 percent) of the laborers or mechanics in the classification on similar projects in the area during the period in question,” or to a weighted average if no single wage was paid to more than 50 percent of workers. The Labor Department argued the change was justified on the grounds that the 30 percent rule “does not comport with the definition of ‘prevailing,’ that it ‘gives undue weight to collectively bargained rates,’ and that it is inflationary,” according to a 1983 federal appeals court decision, which upheld the regulation in the face of a challenge from construction unions. As currently applied to federal projects, Davis-Bacon compensation rates are determined by the U.S. Labor Department’s Wage and Hour Division, using voluntary employer surveys compiled by the Construction Industry Research & Policy Center at the University of Tennessee. The resulting wage and benefit determinations vary in timeliness, representativeness of the sample and other considerations. New York is among 31 states that still have prevailing wage laws; 19 have either never passed one or have repealed their statutes, with the most recent such repeal taking effect in January in Kentucky. The surviving state laws vary, but all extend the Davis-Bacon approach—defining “wages” to include benefits—to projects created for a public entity or classified as a public works project. No laborer, worker or mechanic, in the employ of a contractor or sub-contractor engaged in the performance of any public work, shall be permitted to work more than eight hours in any day or more than five days in any week, except in cases of extraordinary emergency; nor shall he or she be paid less than the rate of wages prevailing in the same trade or occupation in the locality within the state where such public work is to be situated, erected or used. The New York State Department of Labor (NYSDOL) is responsible for calculating the prevailing wage for state and local government projects throughout the state— except in New York City, where the city comptroller promulgates prevailing wages for public works projects in the city. In practice, both NYSDOL and the city comptroller derive their prevailing wage schedules from labor union contracts covering specific building trades, and the two wage schedules are usually the same. 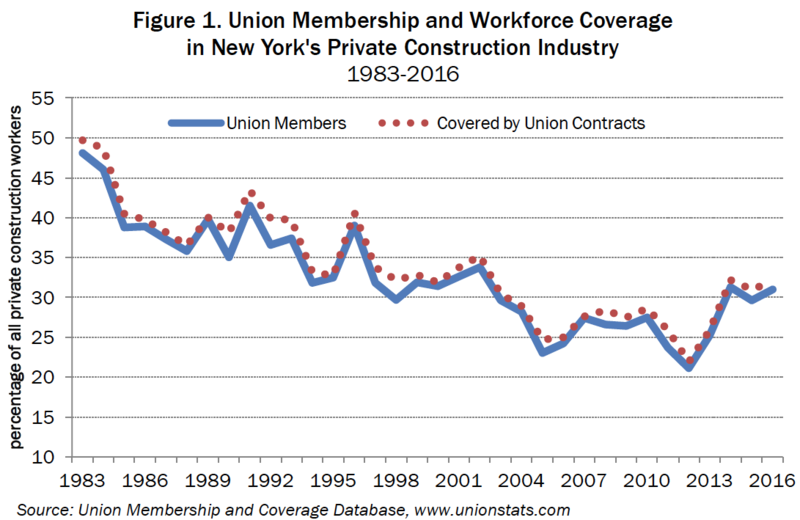 As shown in Figure 1, above, the number of total private construction jobs covered by union contracts in New York is down sharply from the 50 percent level of 1983, when the state prevailing wage law was revised to reflect a 30 percent rule. The rebound in construction union coverage over the past four years has coincided with a post-recession building boom centered in New York City, where union contractors still dominate the high-rise commercial building sector. Statewide, some of the biggest projects undertaken during this period—including the new Tappan Zee Bridge, upstate urban school modernization projects, and the “Buffalo Billion” solar panel factory—have been reserved for union contractors. Yet even with this government push, only 32 percent of construction workers statewide had wages covered by union contracts last year. As of 2016, the estimated statewide union coverage in New York State’s construction industry was more than double the national average of about 15 percent. New York’s union coverage level was exceeded in only three states: Hawaii (41 percent), and Minnesota and Illinois (tied at 37 percent). Even in New York, however, the long-term private-sector unionization trend points inexorably downward. A permanent fall below the 30 percent union coverage threshold is inevitable for most of New York’s building trades; indeed, the available data indicate it already has happened in historically less union-intensive upstate areas. In that case, the law would set the prevailing wage at the “average … in the locality.” This would yield a much lower figure in all regions, based on federal occupational statistics further explained in Section 3 of this report. Information relating to the two most crucial variables used to calculate the wage—actual copies of construction union contracts and pay scales for each region, and the headcount of workers employed under those agreements—is not accessible to the public. In addition, neither NYSDOL nor the New York City comptroller is required to survey employers to independently verify that the threshold actually is being met. While public works contractors in New York have legal standing to challenge the wage mandate on the grounds that covered employment falls short of 30 percent, potential plaintiffs face a legal Catch-22: the burden of proof is on any party seeking to challenge a wage determination, and courts have ruled government agencies cannot be compelled to share the kind of “extremely broad and undefined” information needed to demonstrate that the coverage threshold has been met. As further stipulated in the law, Section 220 mandates payment of “supplements,” defined as “all remuneration for employment paid in any medium other than cash, or reimbursement for expenses, or any payments which are not ‘wages’ within the meaning of the law, including, but not limited to, health, welfare, non-occupational disability, retirement, vacation benefits, holiday pay, life insurance, and apprenticeship training.” Lower-paid apprentices are allowable only if they belong to state-certified apprenticeship training programs, which are sponsored mainly by unions and unionized employers. Given the number of different construction trades and the varying geographic footprints of the 135 union locals around the state (as described further on page 9), the determination of prevailing wage is a complex process. Private contractors are provided with a rate sheet in advance of bidding on public sector work. Although NYSDOL makes the final determination of applicable rates for any given project, an advisory schedule is published. Posted online as a 6.6 megabyte file, it runs to 2,539 pages. As an example of the specificity and complexity, the prevailing wage determination for “Operating Engineer–Building” for nine Finger Lakes and Southern Tier counties is shown in Appendix B. The prevailing wage mandate affects the cost of public works projects in two principal ways. First, it imposes a wage and benefit structure routinely exceeding market compensation rates in any given region. The difference between union and overall average construction industry compensation is the principal focus of this study. Second, while not formally requiring contractors to employ only union members, the law has the same effect, especially on larger projects where union bidders are competing with non-union contractors. Not all public construction projects employ union labor exclusively, but the pressure to do so is considerable. The use of union labor brings with it contractually dictated union practices and work rules, plus jurisdictional agreements among union locals, that can hinder productivity. New York’s prevailing wage law allows con­tractors to pay a lower wage to apprentices, provided that these workers are enrolled in a NYSDOL-certified apprenticeship program. It also stipulates that the ratio of apprentices to “journeyworker” (skilled workers who have completed their ap­prenticeships), as well as the ratio of apprentice-journeyworker compensation, be “prevailing in the locality” where the work is performed. The list of NYSDOL-certified apprenticeship pro­gram sponsors is dominated by construction unions and unionized employers. As noted above, when the prevailing wage requirement triggers the use of union la­bor, this brings along union worksite practices. The use of union labor can invoke the costly jurisdictional practices of the various trade locals—essentially the union-determined distribution of work among different trades. The division of labor into specialized tasks can powerfully boost productivity and economic growth, as Adam Smith was among the first to recognize more than 200 years ago. But the inflexible and arbitrary divisions created by union contracts also require more intensive, time-consuming managerial coordination on construction worksites, reducing productivity and hindering adoption of more efficient practices. A member of the operating engineers union—among the most highly paid of all the trades—must run even fully installed, au­tomated elevators in a building under construction. Therefore, carpenters, plumbers, electricians and other tradespeople working on upper floors must rely on an engineer to push the elevator buttons for them. Operating engineers also are required to stand by and “monitor” pumps and welding units, a practice justified on safety grounds before the advent of self-contained equipment that does not require constant watching. Building concrete floors and foundations requires workers from five different construction trades: carpenters to fabricate temporary wooden forms, lathers to place rebar, and different crews to place the concrete, finish the concrete, and strip away the forms. Each crew has to complete its work before the next can start, requiring 30 to 40 percent more labor and adding substantial time to the process. The process of putting up, taping and painting drywall—which can be performed by a single team of workers on a non-union site—is divided among three different construction trades. Even when a single team does the work, the prevailing wage law requires contractors to keep track of time and wage rates for each of the three steps in the drywall installation process. Plumbers and electricians claim jurisdiction over the installation of standard kitchen refrigerators—work that could be done at no extra charge by appliance delivery crews. As a result, the additional cost of installing a new refrigerator can exceed the cost of the appliance itself. The number of workers involved in moving a piece of plate glass is determined by the size of the glass—as if it were being moved manually, as was the case decades ago, when the work rules were written—rather than by the requirements of mechanized equipment now used in the process. Construction unions also resist the use of technologies that can boost efficiency, such as the automatic drywall taping tools now common on large projects employing non-union workers. Union rules don’t allow for pre-cutting of pipes, which means hundreds or even thousands of pieces must be cut on site by steamfitters. Faced with stiffer competition from non-union workers, construction unions have agreed to enter project labor agreements, also known as PLAs, in which some job classifications are broadened and work rules are waived or modified. Buttressed by union pledges to avoid disruptive work stoppages, PLAs have promised savings in the range of 20 percent, according to published industry and labor union estimates. In practice, however, union promises in PLAs have not always been kept, leading to a significant reduction in projected savings. In July 2015, for example, members of the District Council of Carpenters walked off 20 job sites in New York City, including at least a dozen projects covered by PLAs with no-strike provisions, before being ordered back to work by a federal judge. Trade unions have been known to engage in protracted disputes to preserve their respective occupational domains. One such instance occurred in 2005, when the International Brotherhood of Electrical Workers (IBEW) Local 3 challenged the Laborers Local 78 over the drilling of holes for electrical work at Frances Lewis High School in Queens. Local 78 was considered to have jurisdiction over the drilling of holes that contain asbestos, with Local 3 controlling the drilling of holes where asbestos was not present. As the presence of asbestos was initially “suspected,” Local 78 had begun the work. Local 3 challenged Local 78’s jurisdiction and was awarded the work in arbitration in October 2005, as asbestos was found not to be present. For technical reasons, the decision was appealed by IBEW to the National Plan for the Resolution of Jurisdictional Disputes in Washington, however. At this point, the Mason Tenders District Council (the union representing asbestos and hazardous materials workers—and also, incongruously, Catholic high school teachers) got involved in the case. The case wasn’t finally resolved until November 2006. Careful coordination by the general contractor among the various trades can minimize efficiency impacts; for example, by ensuring that carpenters and laborers have completed necessary preparatory work in advance of electricians and plumbers arriving on the job site. This level of coordination is not costless even when everything goes smoothly; the cost imposed by this inflexibility increases when unexpected problems arise. But other jurisdictional rules, such as the operating engineers’ control of elevators, lend themselves to classic featherbedding. Contractors argue that, combined with high wage and benefit costs, union jurisdictional claims and other work rules raise costs at the job site. Unions make an opposing argument that their workers often are better trained in safety procedures, and more experienced, skilled and productive, ultimately saving money. The productivity difference between union and non-union labor—assuming it could even be reliably quantified, absent detailed comparable project budget data—is beyond the scope of this study, which focuses on the wage and benefit differential. New York State has 10 officially designated labor markets—groups of counties that also comprise the state’s economic development regions. But “prevailing” pay for public works is not based on these regions or any other officially recognized or commonly cited set of metropolitan boundaries. Instead, different rates of pay are set for multiple unique permutations of counties and portions of counties. These “locality” rates often cross into multiple economic regions, in some cases stretching clear across upstate New York. For example, the Western New York labor market and economic development region consists of Allegany, Cattaraugus, Chautauqua, Erie and Niagara counties. But building carpenters on public works projects in Erie County and part of Cattaraugus County must be paid different rates than those in Niagara County, which is grouped with all or part of three counties in the Finger Lakes region to the east. Plumbers on public works projects in Buffalo have yet another schedule, applying to all of Erie, Niagara and Wyoming counties and to some (but not all) towns in five other Western New York and Finger Lakes counties. Still another set of boundaries applies to pay for electricians, plumbers and so on—all ultimately reflecting the jurisdictions of unions, rather than the established commuting and trade patterns that normally define a geographic labor market. Given financial constraints on government capital budgets, including New York’s state budget debt cap and cap on local property tax levies, capital dollars should be stretched as far as possible. Furthermore, with Governor Cuomo’s pledge of state support to more than $100 billion in planned major infrastructure and other building projects, most of which would be subject to the prevailing wage law, even small differences in cost will mean less public housing, fewer miles of new highway and more bridges left unrepaired. When the program was due to expire in 2015, Governor Cuomo said he would not support a 421a renewal unless the affordable housing component was made subject to prevailing wage. Developers opposed the extension of the prevailing wage law to a previously exempt category of privately owned and sponsored affordable housing. An attempt at compromise failed and 421a expired in January 2016.The proposed renewal of New York City’s so-called 421a tax exemption for housing construction, first passed in 1971, has turned a fresh spotlight on the issue. For newly constructed market-rate condos, co-ops and rental apartments in an “exclusion zone” of Manhattan, the law made tax abatements available only to developers who also agreed to construct or finance affordable housing, either on-site or elsewhere in the city. In the fall of 2016, the governor announced a 421a renewal “deal” between developers and the unions that would offer tax abatements of up to 35 years to developers of residential buildings with 300 or more units in parts of Manhattan, Queens or Brooklyn, provided they set aside a certain percentage of affordable apartments for 40 years and agree to pay construction workers average hourly wages and benefits of $60 in Manhattan and $45 in certain waterfront areas of Brooklyn and Queens. The impact of the pay provision would be less onerous than the prevailing wage because it would not also impose union rules on contractors. Governor Cuomo subsequently incorporated language implementing the 421a deal in his fiscal 2018 state budget proposal. To assess the potential impact of a blanket prevailing wage mandate on affordable housing projects, New York City Independent Budget Office (IBO) developed a multiple regression analysis of construction costs for 211 city housing projects built over a six-year period. These included 22,157 affordable units, 5,856 of which were subject to the prevailing wage law. With the final construction budget submitted to the city Department of Housing Preservation and Development as the dependent variable, independent variables included borough, unit size, whether the project included parking, the share of units that were affordable and a few other factors. IBO concluded that total construction cost increased by 23 percent when a developer was required to comply with the prevailing wage mandate. Requiring prevailing wage across the board would add $4.2 billion in costs to Mayor de Blasio’s plan for building 80,000 affordable units, the analysis said. The IBO study also reported the prevailing wage impact more narrowly on the “hard cost” of construction. On that smaller total, the prevailing wage requirement increased total cost by 28 percent. The strength of the IBO methodology is the degree to which it reflects variation in labor productivity as well as the difference in labor cost. Because the projects in question were government-subsidized, IBO’s well-executed study also had the advantage of access to construction budgets on file with a city agency. Such records are not easily available for any large subset of projects currently or potentially subject to New York’s prevailing wage law, however, making other methodological approaches necessary. 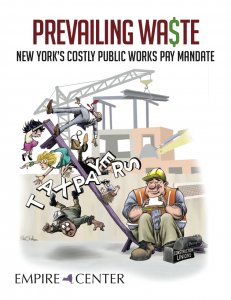 A white paper issued in 2012 by Columbia University’s Center for Urban Real Estate featured a deeper exploration of the “complex worlds” of prevailing wages, focusing on the questionable methodology used to develop New York State’s prevailing wage schedule. While not measuring the project cost differential directly, the study assumed that the New York prevailing wage law adds 25 to 30 percent to the cost of development, which is also consistent with a commonly cited industry estimate.The IBO finding was consistent with an earlier literature review and analysis by the Citizens Housing and Planning Council, indicating that the imposition of prevailing wages would raise affordable housing costs by 25 percent. Even within the unionized sector of the construction industry, there is little dispute that union labor drives a significant cost differential. For example, the head of the city’s Building Trades Employers Association has said that non-union construction is 20 to 25 percent cheaper than union labor, giving rise to an increasing role for “open shop” contractors using a mix of union and non-union workers. The construction cost impact of the prevailing wage mandate will vary, depending on the project. Some sites or building designs will require more specialized and expensive labor than others. “Soft costs”—such as design, permitting and financing—will differ dramatically from project to project. The difference between legally “prevailing” union compensation levels and non-union pay rates varies from trade to trade, and from locality to locality. Practically speaking, there can be no general finding that applies to all projects in all settings. However, using a 2008 study of this topic by the Center for Governmental Research (CGR) as a starting point, we developed (a) a prototype set of construction occupations that are representative of actual projects, (b) a table of prevailing wage and non-union labor rates by these same occupations, and (c) an assumption concerning labor’s contribution to overall project cost. The distribution of construction trades required in a project—carpentry vs. electrical, for example—and the labor share of a project costs are important to the outcome. Our model is designed to allow these to vary, thus allowing us to apply sensitivity analysis to our conclusions. We report here a single distribution of trades based on the national average reported by the U.S. Bureau of Labor Statistics Occupational Employment Statistics (OES) series. OES data provide both occupational shares by industry and average wage by detailed occupation for metropolitan statistical areas and metropolitan divisions. In New York State, OES data are reported for 11 upstate metropolitan statistical ar­eas, and for two additional pairs of downstate suburban counties (Dutchess-Putnam and Nassau-Suffolk). New York City data are not separately reported but are incorporated in numbers for the New York-New Jersey-White Plains Metropolitan Division, which also includes three New York State counties (Orange, Rockland and Westchester) and six New Jersey counties (Bergen, Hudson, Middlesex, Monmouth, Ocean and Passaic). At the national level only, OES reports the labor composition of specific industries, i.e. the total labor employed by the industry, broken out by trade. For purposes of this study, we relied on OES data for the nonresidential construction industry. OES does not report multi-story, multi-family residential buildings as a separate sector. Nationally, residential construction is dominated by stick-built single-family and low rise multifamily structures. The construction of apartments and condos in New York City is more comparable to similarly sized office buildings. 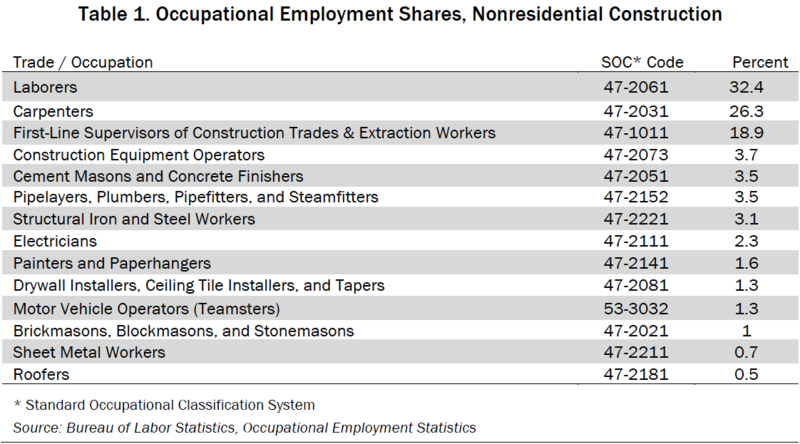 The national nonresidential construction industry employs the major construction trades in the proportions reported in Table 1, below. A few of the smaller trades have been incorporated into larger trades with similar skills and pay. Again, these proportions will vary from project to project and are used here as one source of information about a “typical” nonresidential construction project. Workers in additional occupations also can be found in the nonresidential construction industry, of course. Out of 724,000 employed in the industry, 58 percent are employed in occupations classified as construction trades. We included motor vehicle operators in the analysis, bringing the total to 60 percent of nonresidential construction industry employment. The findings of this study ultimately are based on estimates of wages and benefits for different trades in New York’s private construction industry. Data limitations, however, create a challenge when it comes to parsing differences between “prevailing” union compensation and the total pay of non-union construction workers. The Occupational Employment Statistics (OES) survey produces an estimate of average wages (but not benefits), broken down by metropolitan statistical area, for all persons employed in hundreds of different occupations. However, the survey does not distinguish between union and non-union workers. There are no authoritative government statistics estimating union vs. nonunion pay on a state or regional level. For occupations with low levels of unionization—as is now the case in most industries—the OES averages can be considered a fairly accurate reflection of the predominant nonunion wages. New York’s building trades, however, continue to include a substantial minority of employees covered by collective bargaining agreements, which mandate pay and benefit levels higher than the norm for non-union workers. As of 2016, 31 percent of New York City’s construction workers were unionized, according to an estimate by the Murphy Institute at the City University of New York. Using the same Current Population Survey (CPS) data as the Murphy Institute, economists Barry T. Hirsch and David A. Macphersona estimated that 31.6 percent of the private construction jobs in New York State were covered by union contracts last year.b At the regional level, their only statistically valid estimates were 28.1 percent union coverage for private construction in the New York City metropolitan area (including parts of New Jersey, Connecticut and Pennsylvania); and 14 percent for Albany-Schenectady. Unfortunately, not only do we lack construction occupation unionization figures for most New York metro areas, but the available estimates reflect union coverage in all private construction sectors, not differentiating among residential, non-residential buildings, and heavy highway and bridge construction. Therefore, any attempt to isolate a nonunion wage component based on the existing data would produce crude and ultimately unreliable results. That said, because the OES survey data includes wages for union workers, and because unionized building trades workers generally have higher compensation levels, the resulting occupational averages in the construction sector must exceed the norms for non-union workers. In some localities, such as New York City, that difference is likely to be large. Our results, therefore, inevitably understate the true cost of the prevailing wage on public works construction—without considering the impact on productivity of union work rules. As noted above, the NYSDOL list of prevailing wage determinations by trade and locality, incorporating wage determinations by the New York City comptroller, is over 2,500 pages long. Reflecting the various collective bargaining agreements, many trades have detailed wages for a range of varied skills. The Operating Engineer wage list is typically complex, as illustrated in the sample included in Appendix B. There is no simple cross-walk of the very detailed trades specified in union collective bargaining agreements (the basis for the prevailing wage) to the more aggregated occupations for which wages are reported by the OES data. We developed our comparison by matching the major union building trades to OES occupational categories based on the closest Standard Occupational Classification code. The prevailing wage file posted by NYSDOL includes the union journeyworker wage and benefit, apprentice wage and benefit, and the allowed ratio of journeyworker to apprentice compensation. 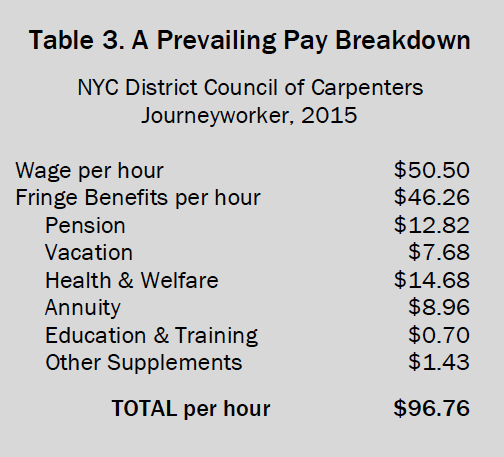 For example, as detailed in Table 3 on page 21, union carpenters in New York City receive hourly pay of $50.50 plus benefits valued at $46.26 as journeyworkers, a total of $96.76. Meanwhile, wages and benefits for apprentice carpenters total $60.35. One apprentice may be hired for every four journeyworkers; thus, the average cost per worker for a crew of 100 carpenters is about $89 per hour on a prevailing wage project in New York City. For the purpose of estimating the impact of the labor cost differential on the total cost of construction in New York City, CGR employed the IMPLAN input-output model for New York’s metropolitan areas to develop an estimate of the labor component of total project cost. CGR’s IMPLAN model estimates that labor is 44 percent of total cost of nonresidential construction in New York City. The more labor-intensive the project, the greater the cost impact of the prevailing wage mandate. For the New York City region, the model estimates that the hourly cost of union labor in nonresidential construction, weighted by the occupational distribution discussed above, is $75 of wages and benefits. For comparison purposes, we applied the same weights to the median occupational wages reported by the OES, and assumed average fringe benefit costs equivalent to roughly 29 percent of wages. The resulting weighted average of wages and benefits—for a group that includes union and non-union labor—was $40 an hour, just over half the union compensation. The OES reports that construction labor is 60 percent of total labor cost in this sector. IMPLAN, as noted above, estimates that labor comprises 44 percent of total building cost. The added labor costs attributable to the prevailing wage are estimated on a weighted basis, in line with the occupational proportions shown in Table 1. We estimated the difference between prevailing wage union compensation and the weighted average of median OES compensation for six regions of New York State. For New York City, we compared compensation based on the city’s mandated prevailing wage schedule to the weighted average of median OES compensation for the multi-state region that includes New York City. The results are shown in Table 2, below. Union compensation levels ranged from 60 percent above average pay for all construction workers in the Albany area to double the average in the metro area with New York City at its heart. The impact on total project costs ranged from an added 13 percent in the Albany area to an added 25 percent in the New York City area. Based on the conservative assumption that just one-fifth of New York’s state capital projects budget is slated for building construction projects subject to the Section 220 mandate, the prevailing wage mandate will cost state taxpayers nearly $2 billion over the next five years, averaging $400 million a year. New York City’s capital commitments for the next three years include $8 billion in elementary and secondary school construction projects. Added costs due to the prevailing wage will come to least $1.4 billion, net of $195 million in savings attributed to a PLA deal between unions and the city’s School Construction Authority. Focusing on just two high-profile Manhattan projects funded by the state, the mandate to pay union wages and benefits will account for $340 million out of $1.7 billion in total costs for the Moynihan Station redevelopment and Javits Convention Center renovation. The application of prevailing wage brings two public policy goals into conflict. Economic development policy seeks to improve both the quantity and the quality of jobs, thus the pay going to workers. After all, higher-paid workers purchase more goods and services from workers in other sectors and pay higher taxes. The prevailing wage law was intended to reserve publicly funded work for locally based labor in the face of competition from itinerant workers, including immigrants. Public funds are limited, however. Mandating higher wages and benefits for workers on publicly supported projects will reduce the quantity of public goods and services that can be purchased. In the case of affordable housing, for example, given a fixed pool of tax credits and other funds, higher cost translates directly into fewer units of housing. The prevailing wage requirement is, in effect, a transfer payment from taxpayers to a small (and, the data indicate, shrinking) subset of private construction workers—those represented by labor unions. This is more than an issue of compensation, however. The prevailing wage requirement reserves public sector construction jobs for the union locals that control construction jobs in that location. This public policy effectively endorses the complex jurisdictional agreements among the various union locals, such as which holes are to be drilled by laborers vs. electricians, and whether plumbers self-operate automated elevators without the assistance of operating engineers. It also gives favored treatment to a unionized workforce that, in the eyes of some critics, still does not reflect the ethnic or racial diversity of the city’s population. Contractors must also juggle myriad other idiosyncratic elements of the various trades’ contracts; for example, whether overtime pay is required if the worksite is organized around four 10-hour days instead of five eight-hour days, and the number of paid holidays. While very difficult to measure, these various contractual issues surely reduce productivity and increase taxpayer cost. While some academic studies have sought to disprove the notion that prevailing wage laws raise construction costs, the higher pay levels of unionized construction labor are undisputed. What’s less often noted, however, is the extent to which New York City’s construction workers, in particular, are better paid than their counterparts even in other large, union-friendly big cities subject to prevailing wage laws that favor unionized firms. 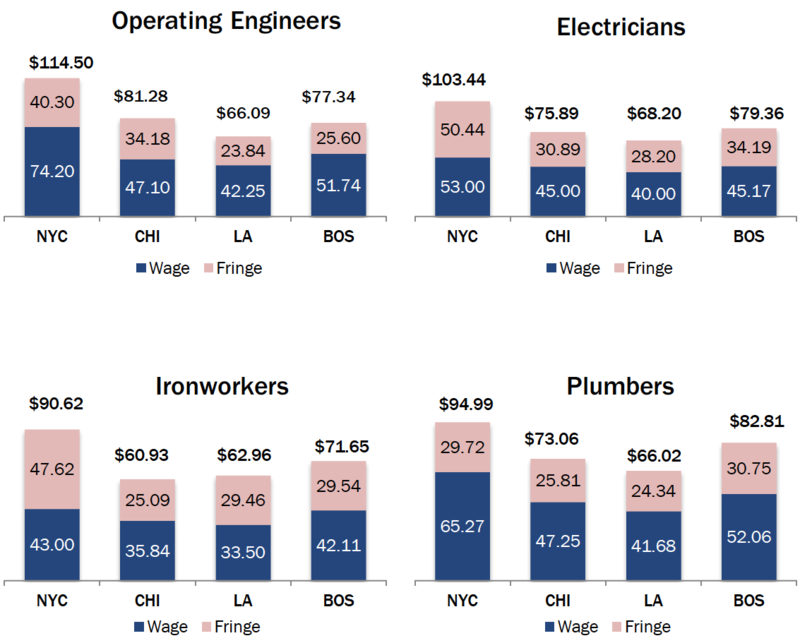 Figure 2 on the following page compares wage and benefit levels for six common building trades in New York City, Chicago, Los Angeles and Boston. For every occupational group except construction laborers, who earn roughly the same in Chicago as in New York, the New York City union pay level (also reflected in the prevailing wage law) is significantly higher than those in the other cities. Other published comparisons taking in a larger number of locations also have found that New York City’s union wages for most building trades are significantly higher than those in other big cities. Pension contributions and health care coverage are the largest items in the fringe benefit packages of most unionized construction workers in New York State. Under the prevailing wage mandate, the high cost of these benefits is effectively subsidized by taxpayers. Most private employers hire and train their own workers, and take responsibility for funding or purchasing employee benefits, including health insurance and retirement savings plans. But it’s different in the “closed shop” construction world, where gen­eral contractors and specialized subcontractors outsource their recruitment, hiring, training and employee benefits to unions. In the unionized construction sector, compensa­tion levels and work rules are controlled by nu­merous collective bargaining agreements, negoti­ated with employer associations by unions repre­senting specialized building trades such as carpenters, laborers, electricians, plumbers and equipment operators. Each trade has its own union, and each union has a separate contract. The unions exclusively supply contractors with skilled workers on an as-needed, project-by-project basis. Why are union benefits so pricey? High fringe benefit costs for unionized construction workers are largely a function of plan design. Pensions and health care coverage are provided to union members by trade-specific “multiemployer” plans, governed by boards of trustees consisting of employers and union representatives. New York State has 120 such plans, organized along regional and occupational lines. The construction industry’s multiemployer pension plans (MEPPs) are similar to the pension plans sponsored by New York’s state and local governments. Like public plans, the MEPPs offer traditional “defined benefit” pensions, promising a fixed stream of regular post-retirement income based on career earnings, longevity and age at retirement. In another similarity to public pension plans, the union MEPPs follow accounting rules that allow them to calculate their funding requirements based on optimistic investment return assumptions, reflected in liability discount rates of 7.5 percent for most funds. The higher the assumed rate of return, the lower amount of the required contribution—and the bigger the resulting unfunded liability if returns don’t match assumptions. By contrast, corporate pension plans are subject to more stringent ac­counting requirements, basing their funding levels on much lower “mar­ket” interest rates for safe fixed-income investments, such as highly rated government or corporate bonds. To have any hope of achieving 7.5 percent annual gains, pension funds need to invest heavily in the stock market—a high-risk, high-reward strategy whose downside has become dramatically apparent twice in the last 15 years, when major stock indices twice plunged by 50 percent or more (in the bear market of 2000-02, and again in 2007-09). Eight years after the end of the Great Recession, public and private pension funds alike are still digging themselves out of the holes created by these losses. In 2013, the latest year for which data are available, the median participation ratio for construction industry pension plans across the country was 0.68, equating to 68 active (working) plan participants for every 100 total participants. In their most recent federal filings, all of New York State’s largest construction union MEPPs had participation ratios below that level. The New York District Council of Carpenters Pension Plan—the second largest construction industry MEPP based in the state, with nearly $3 billion in assets and more than 31,000 members working mainly in New York City—had a participation ratio of 0.41, which would rank in the lowest quartile of all national plans in the latest annual ranking. The Northeast Carpenters Fund, covering thousands of workers on Long Island and upstate, had a participation ratio of just 0.31, meaning inactive participants outnumbered active workers by a 2-1 margin. The New York-based MEPP with the highest participation ratio was the Steamfitters Industry Pension Fund at 0.62, which was still below the national median. Construction union members are among the tiny minority of private-sector workers still receiving retiree health care coverage. Like their pension funds, the unions’ multi-employer welfare funds also have amassed sizable liabilities for current and future retiree health insurance coverage. Covering the same group of workers, the welfare funds have participation ratios (and aging profiles) similar to the pension funds. When an employer deposits a percentage of a worker’s wages in a 401(k)-style defined-contribution account, 100 percent of the contribution becomes the property of that worker alone, adding to his or her personal retirement savings. But in the case of union defined-benefit pension plans, the hourly employer contribution to union pension and welfare funds is based on various factors including the age and projected remaining lifespans of all the workers and retirees vested in the plan; the hours worked and pay earned by current active participants; and the performance of the funds’ investments. For most of the construction plans, the “normal” cost of future benefits earned by each worker in a given year makes up less than half the employer contribution. Most of the employer contribution covers unfunded liabilities for benefits already earned or promised to current and retired workers. This arrangement basically serves the collective interests of workers, retirees and, last but not least, the unions and contractors that jointly sponsor the pension plans. The impact of these added funding requirements varies by union, depending on the financial status and demographic profiles of their pension and welfare plans. Consider, for example, how these factors play out in the New York City District Council of Carpenters Pension Plan. As shown in Table 3 on the following page, prevailing wage rates for a union journeyworker carpenter in New York City come to $96.76 an hour, consisting of $50.50 in wages and total fringe benefit payments of $46.26, including a pension fund contribution of $12.85 an hour and a welfare contribution of $14.64 an hour. At 25 percent and 29 percent of wages, respectively, these are extraordinarily high amounts by private-sector standards. The financial factors shaping the carpenters’ pension and welfare fund contributions emerge from the funds’ required annual reports to the federal government, as highlighted in Table 4 below. During the fiscal year ending in June 2015, the carpenters’ plan collected $235 million in employer contributions, or $18,038 per active worker. The “normal” cost of benefits earned by active workers that year was pegged at $101 million, or $7,718 per worker. But the fund also had to cover $13 million of administrative expenses and $121 million in unfunded liabilities. The result: employer contributions averaging $10,320 per worker, more than half the per-worker total, were devoted to backfilling the plan’s long-term funding shortfall. Applying those proportions to the 2015 average employer contribution of $12.85 an hour, about $5.53 represented the value of benefits earned that year by each worker. The remaining $7.32 per hour covered the pension plan’s unfunded liabilities. A similar pattern occurs in the New York City District Council of Carpenters Welfare Plan. In 2014, employer contributions to the plan for health coverage were billed at an average rate of $13.47 per hour. This resulted in total payment of $257 million, or $20,000 per active worker. Actual health benefit payments for active workers came to $128 million, or $10,000 per worker. The rest of the money raised from employer contributions—nearly half of the total—covered the welfare fund’s current and future health care obligations to retired union members, including $69 million for future retirement benefits earned by active workers during the year. Based on these totals, the welfare plan needed to collect only $6.50 an hour to provide health care to carpenters employed in 2015, but billed another $4 to cover the normal cost of future retiree health benefits earned during the year by those workers. Taken together, the pension and welfare plan figures indicate that nearly $11.32 an hour in fringe benefits, or 11.6 percent of the total hourly compensation for a carpenter, consisted of subsidies to the welfare and pension plans, rather than benefits received or earned during the year by the individual workers. The same general pattern is replicated throughout New York’s unionized construction industry, subsidized by the prevailing wage: in most cases, employer contributions made on behalf of individual union workers serve largely to subsidize union benefit plans and their sponsors. Using their preferred actuarial measures, most of New York State’s construction union MEPPs reported in 2015 that their asset values were above 70 percent of the level needed to cover liabilities, which puts them outside the official “critical” or “endangered” zone. Some even reported they were more than 100 percent funded, when measured on this basis. But the picture is quite different when the plans are evaluated using the same accounting standards that apply to corporate plans. 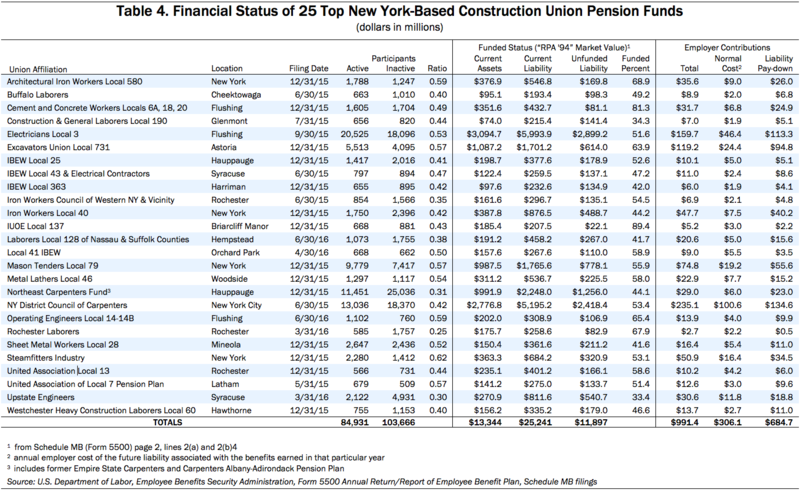 Table 4 on page 22 breaks down key financial indicators based on reports filed with the federal government by 25 of the largest New York-based pension plans sponsored by building trades unions. As shown, these plans covered a total of 188,597 people, of whom 84,931 were active. The union pension plans had $13 billion in current assets against liabilities totaling $25 billion, when discounted using the market rate of interest prescribed by the federal Retirement Protection Act of 1994. Using this measure, also known as “RPA ‘94”, the plans had funded ratios under 50 percent; that is, they had less than half of what they ultimately will need to provide promised benefits to their plan participants. The plans’ total unfunded liabilities came to nearly $12 billion. The union pension plans’ estimated unfunded liabilities were smaller when calculated on the basis of their preferred actuarial measures, most of which used a 7.5 percent discount rate. Nonetheless, the annual increment towards the multi-year “amortized” cost of paying down those liabilities consumed $685 million out of $991 million in employer contributions to the 25 plans. Hourly employer contributions would have to be even higher to raise these pension plans to the more securely funded level as measured by the RPA ’94 standard. The challenges faced by New York’s construction union pension funds are shared by union-sponsored MEPPs across the country, especially since the Great Recession and financial downturn. In recent years, a handful of the largest New York-based construction industry pension funds, including the Upstate Engineers Pension Fund, have been placed on the federal government’s official list of “critical or endangered” MEPPs, meaning they must develop “rehabilitation plans” to ensure they do not go insolvent. The only financial backstop for these private plans is the federal Pension Benefit Guarantee Corp. (PBGC), which itself has only $2 billion in assets to cover $54 billion in estimated liabilities, Moody’s Investors Service reported last year. The corporation is in no position to guarantee more than a small fraction of the benefits promised to fund participants. The Cleveland-based Iron Workers Local 17 pension fund recently became the first MEPP to receive Treasury Department permission to cut retiree benefits under the Multiemployer Pension Reform Act passed by Congress in 2014. In February 2017, New York-based Teamster Local 707’s pension fund ran out of money, turning for relief to the underfunded PBGC. Other, larger New York Teamster pension funds, whose participants include drivers employed in prevailing wage-covered construction projects, reportedly are also teetering on the edge of financial collapse. The kind of defined-benefit pension plan offered by union shop contractors is arguably best suited to workers who spend all or most of their careers on the payroll of a single employer. Unionized construction workers, by contrast, are assigned by their locals to a series of temporary jobs, often on a seasonal basis, in an economically cyclical industry that tends to slow down (reducing pension fund contributions) at times that coincide with general financial downturns (reducing asset values). A defined-benefit plan is a singularly expensive approach to providing retirement and health benefits for such workers. The construction industry as a whole is better suited to defined-contribution retirement savings plans, which would give each worker an individual account backed by employer and employee contributions. The unions themselves obviously realize the benefits of such an approach, because many have successfully bargained for employer contributions to their own defined-contribution annuity plans, which supplement their pensions. The New York District Council of Carpenters, for example, has an annuity fund to which employers contribute $8.96 an hour, on top of the $12.58 going to the pension plan. In contrast to the pension contribution, nearly all of that $8.96 per hour fully and solely benefits the employees who earn it. Construction union members appear to be unique, even among workers in physically demanding industries, in having both defined-benefit pensions and generous defined-contribution annuities. The defined-benefit model assigns all investment risk to the pension plans—which, as noted, are sponsored by the unions themselves, in partnership with employers. A defined-contribution plan shifts the risk of investment losses to individual retirees, so it’s especially important for construction workers to have a well-designed plan supported by a relatively high level of ongoing contributions. This could be accomplished, at a lower net cost to employers, by phasing out the defined-benefit pension funds and shifting entirely to defined-contribution funds, building on the kind of annuity plans that most unions already have. Health benefits, likewise, could be funded more cost-effectively by separating retiree benefits from those of active workers, and by funding retiree benefits on a defined-contribution basis. In the meantime, to the extent that New York prevailing wage props up defined-benefit plans, it delays the inevitable day of reckoning for a costly, unsustainable and unreliable benefits model. The prevailing wage mandate inflates total public construction costs by at least 13 to 25 percent, depending on the region, without including the productivity-eroding impact of work rules. This translates into billions more in borrowing and higher debt service expenses and, ultimately higher taxes. A portion of the added spending isn’t flowing into the pockets of construction workers; rather, it’s effectively bailing out their pension and welfare plans, which have significant unfunded liabilities. The losers in this process are the taxpayers—who must come up with larger amounts of money than a normal, competitive labor market would require—and the potential beneficiaries of the public work, such as New Yorkers seeking affordable housing. Higher costs inevitably lead to fewer capital projects. The winners are some of the nation’s best-paid construction workers and the shrinking but politically powerful unions to which they belong. The more market share the unions lose, the more they depend on government mandates to keep their members working—and crucially, to keep employer contributions flowing into pension and welfare funds. New York State’s constitutional prevailing wage requirement need not be repealed to create a better, more productive and more transparent system. Crucial reforms to Section 220 could break the costly union monopoly on construction labor and free more dollars for essential public infrastructure projects. Conduct a statistically valid survey of the private construction sector in each metropolitan area of the state to determine the share of a trade’s workers covered by a collective bargaining agreement, as required by law. In localities where the threshold had not been reached, base the “prevailing” wage on federal OES surveys and tabulations. Eliminate the statutory 30 percent rule, instead matching the Davis-Bacon threshold of either a wage covering at least 50 percent of a given trade or a weighted average wage for each trade in a given locality. Limit the scope of the mandate to the common, dictionary definition of “wage”—the amount directly paid to workers on an hourly basis, before taxes and excluding benefits, also eliminating the application of union work rules. Ensure the entire process is transparent, keeping confidential only data that is directly related to employer-employee confidentiality. [*] These comparisons in all cases exclude government-required employer payments for Social Security and Medicare taxes, workers’ compensation insurance, and unemployment insurance. [†] The 16,000-participant Empire State Carpenters Pension Fund has since merged with financially troubled pension plans covering union carpenters in New Jersey and the Albany-Adirondacks region to form the Northeast Carpenters Fund. Less than half the Madoff-related losses will be made up through insurance and litigation settlements. See David E. Bernstein, “Only One Place of Redress: African Americans, Labor Regulations & The Courts from Reconstruction to the New Deal,” Duke University Press, 2001, pp. 66-84. By all accounts, Bacon and other northern supporters of the prevailing wage law did not explicitly make race an issue, concentrating instead on the exploitation of what Bacon termed “cheap, bootleg labor” and the denial of job opportunities to local workers. However, Bernstein’s account documents pronounced racialist and nativist subtext to Davis-Bacon labor laws enacted in the 1920s through the New Deal era. Building & Construction Trades Department, AFL-CIO, et al.,v. Raymond J. Donovan, Secretary of Labor, et al. Nos. 83-1118, 83-1157, U.S. Court of Appeals, District of Columbia Circuit. The Beacon Hill Institute offered a critical review of the wage determination process in a 2008 report: The Federal Davis-Bacon Act: The Prevailing Mismeasure of Wages, http://www.beaconhill.org. Also see U.S. Department of Labor Davis-Bacon Surveys at https://www.dol.gov/whd/recovery/pwrb/Tab5.pdf. A complete list of states with prevailing wage laws as of 2016 can be found at https://www.dol.gov/whd/state/dollar.htm. Prior to a 1983 amendment, the state Labor Department set prevailing wages based on surveys of wages paid to at least 40 percent of construction workers in each locality. The union-supported reduction in New York’s threshold was enacted the same year that the Reagan administration raised the Davis-Bacon coverage threshold to 50 percent of workers. NYS Labor Law § 220 http://public.leginfo.state.ny.us/lawssrch.cgi?NVLWO: Full text in Appendix A. Construction union coverage as of 2016 was estimated by the Union Membership and Coverage Database (unionstats.com) at just 28 percent for the New York-Newark, NY-NJ-CT-PA Combined Statistical Area, which includes all of New York City and Long Island, six counties in the lower Hudson Valley as well as all of northern and central New Jersey and six counties in northeastern Pennsylvania. Union Membership and Coverage Database, compiled from federal data by economists Barry T. Hirsch and David A. Macpherson, www.unionstats.com. Matter of Suit-Kote Corp. v Rivera, 2016 NY Slip Op 01539, decided on March 3, 2016, Appellate Division, Third Department. The plaintiff in the case was a Cortland-based highway paving company whose president, Frank Suits, is chairman of the board of the Empire Center. He was neither consulted nor played any role in the presentation of this report. Elizabeth A. Roistacher, Jerilyn Perine, Harold Shultz, “Prevailing Wisdom: The Potential Impact of Prevailing Wages on Affordable Housing,” Citizens Housing & Planning Council, December 2008. Julia Vitullo-Martin, “The Complex Worlds of New York Prevailing Wage,” Center for Urban Real Estate, Columbia University, June 2012. http://nysafah.org/cmsBuilder/uploads/The-Complex-World-of-Prevailing-Wage.pdf. The OES survey is a semi-annual mail survey of non-farm establishments conducted by the NYS Department of Labor under U.S. Bureau of Labor Statistics guidelines. The sampling frame is derived from the list of NYS establishments maintained by NYSDOL for unemployment insurance purposes. NYSDOL mails the survey materials to the selected establishments and makes follow-up calls to request data from nonrespondents or to clarify data. The OES tables report the hourly and annual 10th, 25th, 75th, and 90th percentile wages. See http://www.bls.gov/oes/oes_ques.htm#overview. IMPLAN is built on the input-output table for the U.S. economy that is developed by the Bureau of Economic Analysis, U.S. Department of Commerce. An input-output table is a matrix containing all the goods and services in the economy. For a final good sector, e.g. nonresidential building construction, it shows inputs from all other sectors including the household sector’s contribution of labor. IMPLAN regionalizes these data using available information at the county and MSA level. This enables the user to estimate total labor demand for an increase in demand from the sector in question. For nonresidential construction in NYC, IMPLAN estimates that labor will receive 44 percent of the final cost of nonresidential building construction. See https://implan.com/ for more technical detail. See “Employer Costs for Employee Compensation,” U.S. Department of Labor, Bureau of Labor Statistics, March 17, 2017. Based on average fringe benefit costs as a percentage of all private construction wages, excluding legally required payroll taxes and insurance. Slightly more than one-third of the state’s capital budget is slated for highway, bridge and mass transit projects, while this report’s estimates focus on building construction and renovation projects. Another sizable but ultimately unspecified chunk of the state capital plan will finance equipment purchases, economic development grants, and building maintenance and operation costs. The prevailing wage estimate is a blend of the cost impacts weighted for regional shares of state population. “De Blasio Administration Announces Labor Agreements on Public Projects to Reduce Costs, Increase Opportunity for City’s Minority and Women-Owned Business Enterprises,” June 4, 2015 press release, Office of the Mayor. Frank Manzo IV, Alex Lantsberg and Kevin Duncan, “The Economic, Fiscal, and Social Impacts of State Prevailing Wage Laws: Choosing Between the High Road and the Low Road in the Con-struction Industry,” Illinois Economic Policy Institute and Smart Cities Prevail, Feb. 9, 2016. “Union Wages See Modest Gain,” Engineering News Record, 3Q Cost Report-Labor, table on Hourly Union Pay Scales by City, pp 6-7. Mechanical Contractors of America and Horizon Actuarial Services, Inventory of Construction Industry Pension Plans, Fourth Edition, February 2016. p12. The “prevailing rate of wage,” for the intents and purposes of this article, shall be the rate of wage paid in the locality, as hereinafter defined, by virtue of collective bargaining agreements between bona fide labor organizations and employers of the private sector, performing public or private work provided that said employers employ at least thirty per centum of workers, laborers or mechanics in the same trade or occupation in the locality where the work is being performed. The prevailing rate of wage shall be annually determined in accordance herewith by the fiscal officer no later than thirty days prior to July first of each year, and the prevailing rate of wage for the period commencing July first of such year through June thirtieth, inclusive, of the following year shall be the rate of wage set forth in such collective bargaining agreements for the period commencing July first through June thirtieth, including those increases for such period which are directly ascertainable from such collective bargaining agreements by the fiscal officer in his annual determination. In the event that it is determined after a contest, as provided in subdivision six of this section, that less than thirty percent of the workers, laborers or mechanics in a particular trade or occupation in the locality where the work is being performed receive a collectively bargained rate of wage, then the average wage paid to such workers, laborers or mechanics in the same trade or occupation in the locality for the twelve-month period preceding the fiscal officer’s annual determination shall be the prevailing rate of wage. Laborers, workers or mechanics for whom a prevailing rate of wage is to be determined shall not be considered in determining such prevailing wage. “Supplements,” for the intents and purposes of this article, means all remuneration for employment paid in any medium other than cash, or reimbursement for expenses, or any payments which are not “wages” within the meaning of the law, including, but not limited to, health, welfare, non-occupational disability, retirement, vacation benefits, holiday pay life insurance, and apprenticeship training. “Prevailing practices in the locality,” for the intents and purposes of this article, shall be the practice of providing supplements, as hereinbefore defined, as provided by virtue of collective bargaining agreements between bona fide labor organizations and employers of the private sector, performing public or private work provided that said employers employ at least thirty per centum of workers, laborers or mechanics in the same trade or occupation in the locality, as determined by the fiscal officer in accordance with the provisions herein. With respect to each supplement determined to be one of the prevailing practices in the locality, the amount of such supplement shall be determined in the same manner and at the same times as the prevailing rate of wage is determined pursuant to this section. “Locality” means such areas of the state described and defined for a trade or occupation in the current collective bargaining agreements between bona fide labor organizations and employers of the private sector, performing public and private work. The fiscal officer, may, and on the written request of any interested person shall, require any person or corporation performing such public work to file with such fiscal officer schedules of the supplements to be provided and wages to be paid to such laborers, workmen or mechanics. Any such person or corporation shall, within ten days after the receipt of written notice of such requirement, file with the fiscal officer such schedules of wages and supplements. An employer may contest a determination by the fiscal officer under paragraphs a and c of subdivision five of this section. The employer must allege and prove by competent evidence, that the actual percentage of workers, laborers or mechanics is below the required thirty per centum and during the pendency of any such contest and until final determination thereof, the work in question shall proceed under the rate established by the fiscal officer. PARTIAL COUNTIES: Genesee: Only that portion of the county that lies east of a line drawn down the center of Route 98, and the entirety of the City of Batavia. Cranes 2 – 251 ton capacity and over hydraulic and lattice boom cranes. Cranes 3 – All tower cranes (when need to climb up) including mobile self-erecting (Potain and similar type). CLASS 1: Air Tugger; All terrain telescoping material handler; Barber Green and similar type machines; Clamshell, Dragline, Shovel and similar machines over three-eighths cu.yd. capacity (Fact.rating); Carrier mounted backhoes that swing 360 degrees; Big Generator Plant Hoist (on steel erection); Bridge Crane (all types); Cableway; Caisson auger and similar type machine; Crane; Derrick; Dredge; Excavator all purpose hydraulically operated; Forklift (with Factory rating of Fifteen ft. or more of lift); Hoist (on steel erection); Hydraulic/Krupp Drill Type; Mucking Machines; Remote Controlled excavator with attachments (Brokk type or similar); Ross Carrier (and similar type); Three-Drum Hoist (when all three drums are in use). CLASS 2: A-Frame Truck; Backfilling Machine; Backhoe – tractor mounted; Belt Crete and similar type machines; Bituminous spreading machine 3/8 yd. capacity or less (Factory Rating); Bulldozer; Carry-all type scraper; Compressors: Four (4) not to exceed 2000 CFM combined capacity; or three (3) or less with more than 1200 CFM but not to exceed 2000 CFM; Concrete Mixer; Concrete Placer; Concrete Pump; Dinky Locomotives (all types); Elevating Grader; Elevator; Fine Grade and Finish Rollers; Fine Grade Machines (all kinds); Forklift with Factory rating of less than fifteen (15) feet of lift; Front End Loader; Gunite Pumping Machine; High Pressure Boiler; Hoist (1 or 2 drums); Maintenance Engineer (Mechanic); Mechanical Slurry Machine (all kinds); Mega Mixers and similar type machines; Motor Grader; Post Hole Digger; Pumps (regardless of motive power) no more than four (4) in number not to exceed twenty (20) inches in total capacity; Shot Crete Pumping Machine; Side Boom Tractor; Skid Steer Loader with attachments; Stoner Crusher; Tournadozer and similar types; Tournapull and similar types; Trenching Machines; Welder; Well Drill; Well Point System; EXCEPTION: Single electric pumps up to and including four(4) inches need not be manned. CLASS 3: Any combination (Not to exceed three (3) pieces of equipment); Compressors – three (3) or less, or not to exceed 1200 CFM combined capacity; Fireman; Longitudinal Float; Mechanical Heater; Pumps (regardless of motive power) No more than three (3) in number, not to exceed twelve (12) inches total capacity; Roller (Fill and Grade); Rubber Tired Tractor; Welding Machine or Mechanical Conveyor (over 12 ft. in length); EXCEPTION: Single gasoline driven welding machine to 300 amps need not be manned. ** Hazardous Waste Site Premium: When an employee is required by Federal, State, Owner or Employer rules or regulations to wear any type of respiratory protection (excluding paper dust masks) in the Class #1, #2, or #3 classification add $2.50 per hour over the appropriate classification. OVERTIME PAY See (B,E,E2,Q) on OVERTIME PAGE. REGISTERED APPRENTICES (1) year terms at the following percentage of journeyworker’s wage.